The German firm that produced a drug at the heart of a disastrous clinical trial that left six men seriously ill has declared itself insolvent. TeGenero, a German pharmaceutical company, said it could not continue in business. Because of the fallout from the UK trial, it was impossible to attract investment, TeGenero said. Claims for compensation arising from the trial will continue to be handled by TeGenero's insurers. 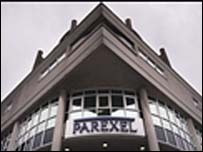 Parexel, a clinical research organisation, carried out the trial on behalf of TeGenero. Six previously healthy men who took part in the trial of the drug, TGN1412, suffered multiple organ failure. The Medicines and Healthcare products Regulatory Authority (MHRA) said Parexel failed to follow proper procedures. It found there was also no contract in place between TeGenero, the makers of the drug, and Parexel at the beginning of the trial. TeGenero has maintained that the men's reactions were "completely unexpected" and did not reflect the results obtained from the earlier laboratory studies.